April 6 is National Tartan Day, a day to celebrate and honor Scotland and the contributions of people of Scottish descent. It is celebrated worldwide but is a national holiday in countries such as the United States (2005), Canada (1993), and Scotland (naturally). The date of April 6 commemorates the signing of the Declaration of Arbroath in 1320, which asserted Scotland's sovereignty over English territorial claims, and which was an influence on the American Declaration of Independence. 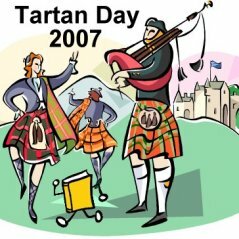 To celebrate Tartan Day in 2007, I (KateKintail) proposed the second Tartan Day Challenge on the BookCrossing site, wherein people would release Scotland-related books (books by Scottish authors, nonfiction books about Scotland, fictional stories set in Scotland or with Scottish characters, etc.). 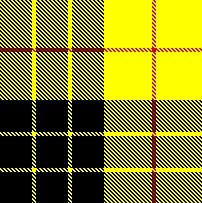 I hoped that this would help me and everyone else celebrate the day, as well as spread the word about Tartan Day and Scotland-related literature. Use of logos in journal entries and labels in books are completely optional. Here are a selection for your use. If you want to make your own, let me know; I'd love to put it here, too!